A number of aquatic invasive species are established in Connecticut and more are threatening to invade. Although zebra mussels continues to expand its distribution along the Housatonic River and remain a great concern. We are focusing on hydrilla this year. Unlike zebra mussels, which are somewhat limited due to their water chemistry requirements (hardwater), hydrilla can likely grow in waters all throughout the state. Hydrilla, an emerging new threat to Connecticut’s aquatic resources. Until recently, hydrilla was found at only a few isolated locations in CT. This invasive aquatic plant can spread aggressively (it can grow up to a foot a day), form dense mats of vegetation, easily outcompetes and displaces native plants, alters aquatic habitats, and interferes with recreational activities. Hydrilla can form very dense stands that can limit foraging habitat for predatory species such as Largemouth Bass. Hydrilla is very difficult to control once established. It typically sprouts later in the growing season, making it difficult to identify until the summer, can sprout in deeper water and/or from fast growing runners, can sometimes fragment easily, and will maintain robust growth through the end of the growing season. Coventry Lake. In the fall of 2015, hydrilla was first identified in Coventry Lake. 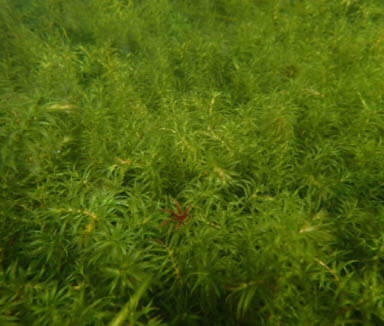 Since then, in collaboration with the Town of Coventry, DEEP has been supporting active management of this population of hydrilla, including funding plant surveys, herbicide treatments and benthic barrier placements. Results have been mixed to date. Connecticut River. In 2016 hydrilla was found in a difficult to access portion of Keeney Cove in East Hartford. Later that year DEEP staff observed several patches of hydrilla mixed in among the aquatic plants growing in the river at Glastonbury’s Riverfront Park and Boathouse. Based on the observed growth, it appeared that hydrilla had been in the river for a couple of years. In 2017 DEEP fisheries staff conducting fish surveys (night electrofishing) identified hydrilla in several new locations including Wethersfield Cove, Crow Point Cove, and in the mainstem in Enfield where it was found scattered along the west shore from the Massachusetts border down to the Enfield Town launch in Thompsonville. Additionally, volunteers from organizations including the Connecticut River Conservancy involved in the Connecticut River water chestnut monitoring and control activities also began looking for hydrilla during their water chestnut surveys and also collected hydrilla from the lower Mattabesset River. Since then hydrilla has spread to more locations throughout the river. The presence of hydrilla near the Massachusetts border and a population upstream in Massachusetts suggests the source population was upstream of Connecticut. At this time it is unclear as to what control is possible in a large river system such as the Connecticut River, so it is imperative that boaters and other users practice “Clean, Drain & Dry” methods to help prevent its spread to other waterbodies. See the next page to learn more on “CLEAN, DRAIN & DRY” procedures. Zebra mussels are now found in a number of locations scattered throughout the Housatonic River and its impoundments. Until late 2010 when adult zebra mussels (Dreissena polymorpha) were found in Lake Zoar and Lake Lillinonah, zebra mussels had been found (1998) in CT only in East Twin Lake and West Twin Lake (Salisbury). Since 2010, adult mussels have also been found in Lake Housatonic and free floating juveniles (veligers) have been sampled at several sites in the river in Connecticut from the Massachusetts line downstream to Lake Lillinonah. Surveys completed in late 2012 confirm the continuing presence of zebra mussels adults and free-floating juveniles (veligers) in the Housatonic River and its three major impoundments in Connecticut, and in 2016, adults were found at the Rocky River power facility, which provides a connection between the Housatonic River and Candlewood Lake. 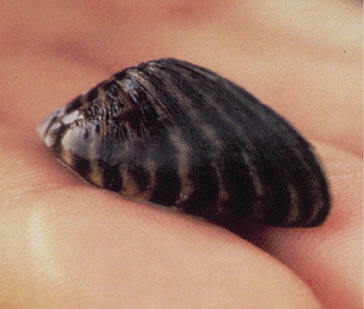 The non-native zebra mussel was first found in North America in Lake St. Clair (Michigan/ Ontario) in 1988. Since then they have spread throughout the Great Lakes, the Mississippi River system and most of New York State including Lake Champlain and the Hudson River, and then into a number of western and southwestern states. Zebra mussels have fairly specific water chemistry requirements and are limited to waters with moderate to high calcium concentrations and pH. In Connecticut, suitable habitat for zebra mussels is mostly limited to a number of water bodies in western portions of the state. Under highly favorable conditions, this invasive mussel can disrupt aquatic ecosystems and is notorious for clogging water intakes and fouling boat hulls and engine cooling water systems. Eurasian water milfoil was first found in Connecticut in 1979 and has been documented in a number of locations in Connecticut as well as the Connecticut River. Variable Leaf Milfoil was first discovered in Connecticut in 1936 and can now be found in a number of locations throughout Connecticut. Fanwort was first observed in Connecticut in 1937 and is now widely distributed throughout the state. Water chestnut was first discovered in Connecticut in 1999 and can be found in a number of locations throughout the state including scattered sites along the Connecticut River, several tributaries and connected. Water chestnut appears to be expanding its distribution in Connecticut. Annual plant that spreads via sharp, spiny fruits. Didymo: As of 2017, Didymosphenia hullii and D. geminata have been observed within the West Branch Farmington River. Until now Didymo had been only confirmed above the confluence with the Still River, Barkhamsted. In June of 2017 both have been confirmed as far downstream as the Barkhamsted/New Hartford town line. Didymo usually “blooms” from December to May. Cymbella janischii: During summer 2015, there was thick growth of C. janischii observed approximately 1.5 miles up and downstream of the Route 318 bridge in Barkhamsted. As of June 2017, the Cymbella bloom is prolific and widespread throughout the West Branch Farmington River Trout Management Area. bloom of C. janischii tends to occur from mid-June through mid-August. While Didymo prefers very cold-nutrient poor waters, C. janischii can tolerate warmer water temperatures and higher concentrations of nutrients (similar to those found in many popular trout streams across Connecticut). We encourage anglers to be vigilant with “Check, Clean, Dry” practices when they are finished fishing the West Branch Farmington River. (2012) Chinese mitten crab A juvenile Chinese mitten crab was collected from the Mianus River in Greenwich. This is the first confirmed report of this invasive in CT. This crab reproduces in saltwater but spends most of its life in freshwater. A Chinese mitten crab captured at Chesapeake Beach, MD in 2007 (image courtesy of the Smithsonian Environmental Research Center). More information on these and other invasive species in Connecticut can be found online at: www.ct.gov/deep/invasivespecies. Please prevent new introductions of invasive plants and animals; CLEAN, DRAIN, DRY your boat and gear. CLEAN, DRAIN, DRY. You can help prevent the spread of problem species by following these simple suggestions. CLEAN—Inspect your boat, trailer and equipment. Remove and discard all aquatic plants and animals, mud and debris you may have picked up while on the water. DRAIN—Completely drain all water from the boat, including bilge water, livewells and engine cooling systems. DRY—Dry anything that came in contact with the water (boats, trailers, trailering vehicle) for at least one week. WASH—Rinse boat, trailer and equipment with hot water (high pressure if possible). A bleach solution can be used to clean livewells. Dispose of all rinse materials properly! Do not transport fish, other animals or plants between water bodies. Release caught fish, other animals and plants only into the waters from which they came. Boaters must inspect their vessel for vegetation and listed invasive invertebrates (zebra mussel, quagga mussel, Chinese mitten crab, New Zealand mud snail, Asian clam, rusty crayfish) and properly remove and dispose of any vegetation or invasives before transporting the vessel. You can be fined $95 per violation. Curly leaved pondweed, Fanwort, Eurasian water-milfoil, Variable water milfoil, Water chestnut, Egeria, Hydrilla, Common reed, Purple loosestrife, Pond water-starwort, Parrotfeather, Brittle water-nymph, American water lotus, Yellow floating heart, Giant salvinia, Yellow iris, Watercress, Onerow yellowcress. Violators can be fined $50 per plant! These websites can provide a good start to learning more about Aquatic nuisance species.